The plan started a few years ago. 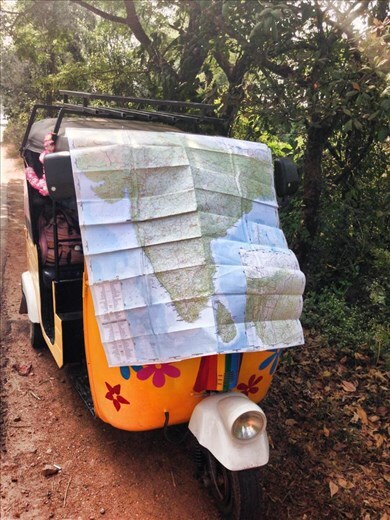 Myself and my equally as crazy friend decided to drive a rickety old rickshaw about 3500kms through India. We would start our journey in Fort Cochin, Kochi and finish in Jaisalmer, Rahjastan. The prospect, at least at first, was a very exciting one. Friends and family thought we were maybe slightly mad, but we however, thought this was a fantastic idea. That was, until the day of test driving the rickshaw in Fort Cochin. As we quickly found out, driving a rickshaw was not all that easy. A cross between a scooter and a motorbike, both of which neither of us had any experience with. That night sat in our sweaty homestay we freaked out. I was covered in bruises from the elbow down from the ancient starter lever, we both had trouble even starting the thing. I also had a very close call, almost veering out of control and into a bunch of innocent bystanders. To be fair, we were both absolutely rubbish at driving the thing and was crawling around at about 10kms/hr in first gear for hours on end. That night whilst contemplating a route, avoiding busy cities and dangerous traffic and considering how we would know we were driving North, we very nearly pulled out and returned all of the sponsorship money we had raised for our charities. We finally realized we were mad and that maybe we couldn’t do it after all. Fortunately, the following day brought with it positive energy and we were in much brighter spirits and ready to take on the challenge of driving our rickshaw (who we quickly named Monty and grew to love) through incredible India. Instead of making a definite route, we decided that we would take things a day at a time. In theory day 1 should have been plain sailing. We left Fort Cochin at 1pm on New Year’s Day and against all the odds and some very nervous driving, we managed our first 100kms. The fact we had 3 breakdowns, including 2 spark plug problems and a fuel leak would have been slightly distressing if it wasn’t for the help of curious and generous locals, random rickshaw drivers and on-duty policemen who’s kindness and generosity was somewhat astonishing. Clearly two young girls driving a rickshaw is not a sight that the local people are used to in this part of the world. Language barriers aside, our experience with the locals on day 1 filled us with hope and positivity that maybe this wouldn’t be quite as difficult as we first anticipated. Fueled by adrenaline from the previous day, day 2 we were up and ready to drive by sunrise. Quite honestly, this was our worst day for driving. Not yet confident rickshaw drivers, and me still unable to get it going, we managed to drive 230kms into Kannur. Our first insight in to Indian culture involved curious local people wanting to talk to us, inviting us for tea, waving excitedly and asking for photographs. We were more than happy to attempt to talk to them and join in their laughter and excited waving. However, our laughing came to an abrupt end when we reached Kannur and experienced the danger of the Indian roads for the first time. A minor bump with another rickshaw and deafening beeps from cars and buses, intense petrol fumes and constantly stalling the rickshaw in the middle of the road left us terrified. We eventually made it to a beautiful beachfront guest house just in time for sunset. The best thing about getting off the tourist track in our rickshaw were times like this, untouched landscapes, amazing local food and hospitality and chatting with local families. Over the next few days we covered about 500kms, we were getting better at driving and, therefore, had the opportunity to revel in the beautiful landscapes and Indian countryside, rescuing a tiny puppy off a busy highway, driving up winding mountain roads and watching water buffalo bathing in rice paddies, this really was the best way to see such a beautifully diverse country. We fit in a much needed day of relaxing on Goa’s beaches, witnessing the glorious sunsets and ruins of Old Goa. At the beginning of our journey, we made a decision not to drive in the dark. On Day 8, we learnt why we really shouldn’t drive in the dark. Indian roads are dangerous at the best of times with pot holes, dirt tracks, no lights, erratic drivers and unlit pedestrians and cyclists. We planned that day to get to the secluded fishing village of Murud. At best, we were getting 60km/hr out of our rickshaw, so about an hour before sunset we were sure we could drive the 40kms we had left to get to Murud. We were wrong. This drive was pitch black, only made worse with our useless head light and filthy windscreen, the road was a complete rubble track and we had only our intuition to tell us if we were heading in the right direction. We gave up on GPS around day 2 when it had us driving around in circles around some downtown hospital in Kerala, eye opening to say the least. When we eventually reached Murud we were pretty surprised that both ourselves and our rickshaw were mainly intact, despite a rather wonky wheel. We woke up the next morning in a truly beautiful beautiful village full of ancient temples, deserted beaches, colourful fishing boats and quirky houses. Taking a walk at dawn it seemed that the whole village was awake doing laundry in the streets, women setting up fruit stalls, children in their pristine school uniforms, men straightening out their fishing nets and families bringing the water from the wells perfectly balanced in sliver jugs on their heads. All to the sound of chimes from the Hindu temples and the scent of the morning offerings of burning incense. This was real India, untouched truly breathtaking. It was worth every moment of the harrowing journing to get there. Over the next few days we managed to drive about another 600kms. Day 9 I won’t talk about, but just know it was a specifically dodgy night spent in an especially horrible place, almost definitely the most unsafe we had felt the whole time in India. But you have to take the bad with the good, and this was all part of the extreme adventure we had embarked upon. By now, the driving was beautiful. The landscape was changing from jungles and rivers, to farmland, lush green fields, peacocks and massive haystacks. We were becoming so confident that we would now drive until the hour before sunset and then look for somewhere to stay. Some days we would drive less than others to stop and look at forts, temples, animals and whatever else fascinated us. Some days we would have long lunches, tasting local delicacies that changed as we drove through the states. My personal favourite being the Thalis, and my least favourite some weird soured curd thing for lunch. I guess this is what you get when the only word in common you both have is ‘vegetarian’. Day 10, we arrived before dusk into a very small town called Kapandvanj. Whilst looking for the only guesthouse in the town, a young girl with perfect English came to talk to us. She invited us for tea with her family to which we obliged. We spent the evening with this wonderful Gujarati family, eating homemade Gujarati foods, drinking copious amounts of tea, letting the girls design henna on our hands and arms and sharing stories and photographs, learning about eachothers lives and different cultures. We were invited to the Hindu temple with the family and visited their friends in the village where we spoke to the children about England and Scotland and gave them little keyrings and badges. This was an experience which taught me a lot about a totally different way of homelife and the culture of the wonderful people in this country I had spent the last 2 weeks in. By this point in our journey, we were making brilliant progress. Rajhastan was on the horizon and despite a few problems including losing a funnel down the petrol tank, driving off with the fuel cap on the roof, a strange clunking sound, being bribed by a policeman for driving on the highway, a flat tyre, a close call with speeding car and many bruises and blisters we really were having an amazing time. As we drove further north, the tiny colourful villages, excited children, sunflower fields and Indian vineyards were replaced with rocky mountains, sandy deserts, cactus, deer and black camels. In our last few days we passed through the beautiful town of Udaipur, the first place since Goa that we saw other tourists. On our last day we drove to Jodhpur where we planned to see the fort as sunrise. To be honest Jodhpur was so busy, we had a fair few near misses in our rickshaw driving up and down market streets completely lost so we were keen to get out of their as soon as possible the next morning. When 7 men had to push the rickshaw out of a car park the next morning we were less than impressed. Our final day driving up to Jaisalmer was one of relief, reflection and total amazement that we had actually done it. These two girls who on day 1 could not even start the rickshaw, never mind drive it, who nearly ran into a bunch of pedestrians, who had no idea on a route, who had zero mechanical skills, and were terrified of going out on the open road, against all the odds…made it to the finish line in one piece. A little dirty, tired, deaf from engine noise, coughs from petrol fumes, and in a state of shock..but in one piece and with massive hearts and heaps of stories! If someone asks ne would I do it again? My response is definitely that the journey was one of the best experiences of my life. These words cannot do it justice. But, I wouldn’t push my luck by doing it again, I think we were pretty lucky completing this this crazy, eye opening, magical, spiritual and terrifying journey without any major disasters and with a total love for India and its rich culture and wonderful people. By far one of the best ways to avoid major tourist spost and see the real incredible India and it's beautiful culture and fascinating people.